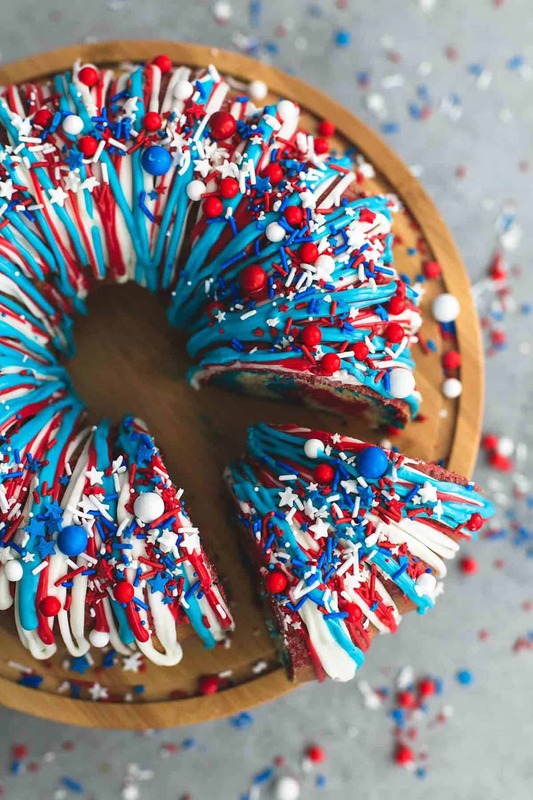 This easy, tasty, and incredibly festive red, white, and blue firecracker bundt cake is the perfect dessert for patriotic holidays and celebrations. 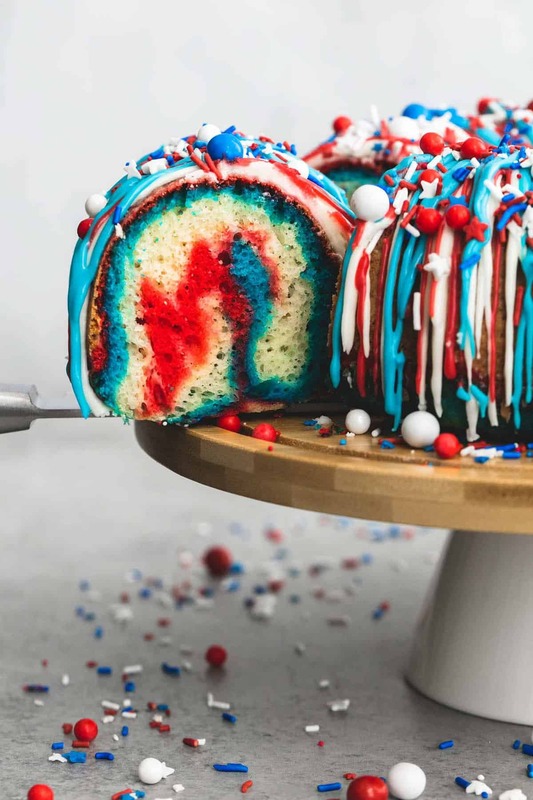 I know July Fourth is tomorrow and this definitely qualifies as a last minute recipe idea, but this year I’ve been simultaneously aching to share this cake with you, and really dreading sharing it as well. I’ve wanted to share it with you because, well it’s completely and utterly delicious in every way, easy to make, and has festive coming out the wazoo. And I’ve been dreading it because if I’m sharing this cake that means July is here and it’s been one year since my nephew’s accident. You may or may not have been following me on social media when I shared some very brief thoughts about my nephews sudden passing in a car accident on July 3rd last year. He was seventeen years old. Maybe you’re close with your nephews, maybe you’re not. But if you’ve had someone close to you disappear in an instant, you might know that every emotion known to man – and a whole slew of new ones you’ve never experienced before – come with an event like this. I was so unready for each and every one of them. And I’m so unready for the one year anniversary of it all. One year later, I don’t even know what to do with myself today. It feels uncomfortable to be doing “normal” things, like planning BBQs and shopping for burger buns, putting the flag out and dressing in red, white, and blue. And eating cake. But honestly nothing feels right today. So I guess cake it is. 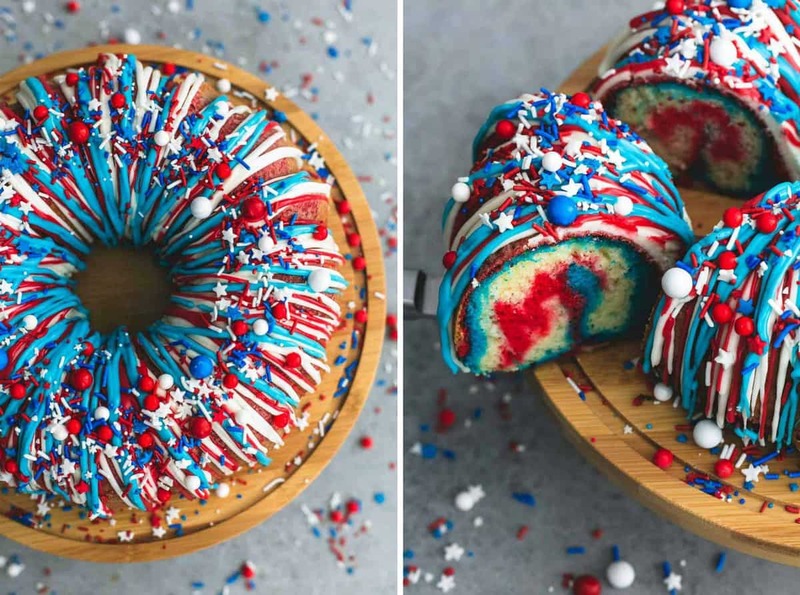 Red white and blue cake with lots of sprinkles and a swirl in the middle. Because I think that’s what you do in a situation like this. You keep on keeping on. You keep eating cake. So I’m sharing this cake, so incredibly last minute, and I hope you’ll forgive me for procrastinating. It’s worth the wait, I promise you. And don’t judge me but it starts with a cake mix. It’s not cheating, it’s really just taking a shortcut right? And my secret ingredient, plus homemade brown butter cream cheese frosting, turns a simple white cake mix into the tastiest Fourth of July treat to ever grace your star spangled tablecloth covered patio table. Spoiler alert: the secret ingredient is almond extract. DON’T SKIP IT. 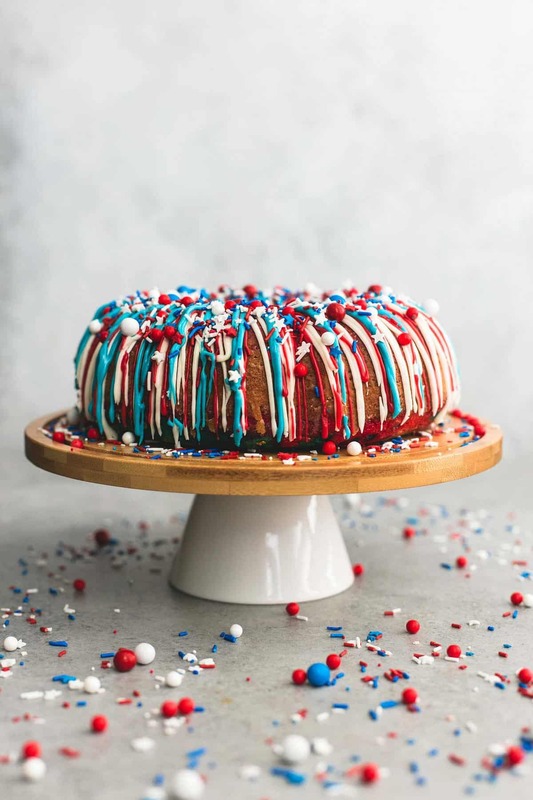 This easy, tasty, and incredibly festive firecracker bundt cake is the perfect red white and blue dessert for patriotic holidays and celebrations. Preheat oven to 325 degrees and generously grease a 12-cup bundt pan. In a large bowl mix together cake mix, water, oil, eggs, almond extract, and vanilla extract until combined and there are no more streaks of flour. Pour 1 cup of the batter into small bowl and stir in red food coloring until desired color is achieved (I use a lot because I like my color darker). Pour a second cup of the batter into separate bowl and stir in blue food coloring until desired color is achieved (again, I use a lot here). First, pour red batter into the bottom of the bundt pan. Next, slowly pour white batter over red batter. Lastly, pour blue patter on top of white batter to make a ring of blue batter in the center of the white layer. Bake for 35-40 minutes or until a toothpick inserted into the center of the cake comes out clean (a few crumbs are okay but no wet batter). Allow to cool on a cake rack until completely cooled, about 30 minutes. Turn cake pan upside down and gently remove cake from pan onto cooling rack or serving platter. Melt butter in a medium sauce pan. When butter is melted, continue to whisk over medium heat until butter turns from yellow to a golden color. Remove from heat. In a medium bowl cream together butter, cream cheese, powdered sugar, vanilla extract, almond extract, and milk until smooth and spreadable. Divide frosting between three bowls, stir red food coloring into one, and blue food coloring into the second. The third will remain white. Drizzle frosting over cake and top with sprinkles if desired. Serve immediately or store at room temperature, covered, up to 24 hours. 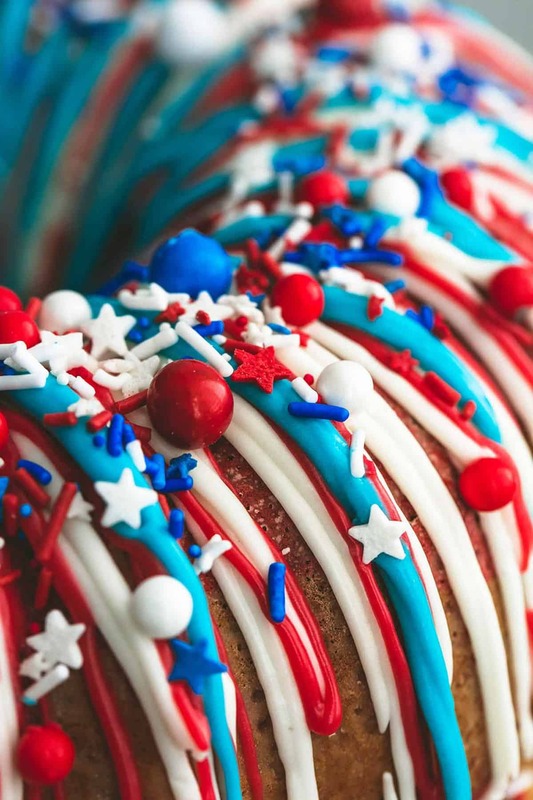 Try these other Patriotic Dessert Recipes! I had been searching for a way to use a boxed mix for tomorrow. Thanks for the tips on making it taste better! Pinned! Hey girl- this cake looks really tasty! I’ll be praying for you and your family. I’m so very sorry about your nephew. 🙁 This cake looks beautiful! Your tribute to your nephew will get you and your family thru the holiday. Perhaps this happy cake will allow everyone to share good memories of his life. Could you update thE ingredients with the number of eggs needed? Hi Aimee- so sorry about that! I will get it fixed asap! Thanks for letting me know! !